There’s an old saying, “Never meet your heroes,” because they’ll let you down by never living up to your inflated expectations. I’ve been pretty lucky in my life that I’ve been able to meet several people who I’ve admired, and thankfully the majority lived up to my expectations. Still, there were a few who were disappointments…and I’m obviously not going to name names, but there were some who were drunk, some who were overly handsy, and some who were dumb and couldn’t carry on a conversation. When I was with the Dodgers there were certainly a few duds, but luckily most of the players and legends I had the privilege of meeting were wonderful. I met guys I’d grown up watching, like Ron Cey, Fernando Valenzuela, and Orel Hershiser, and some that my parents and grandmas had grown up with, like Don Newcombe, Sweet Lou Johnson, and Maury Wills. The retired players often came through the office, and it was expected that we would greet them with, “Hello, Mr. ____” whenever we saw them. My coworkers and I eventually became somewhat blasé about seeing players, but there was one person who, no matter what, always made us giddy if we saw him: Vin Scully. The Dodgers’ long-time announcer rarely walked through the office, preferring to enter through the players’ lot to take the elevator directly to the press box level. That wasn’t a lot of ground to cover, so we’d all be excited if we happened to catch a glimpse of him. But, there were two very hard and fast rules for employees: never bother the current players, and never bother Vin Scully. We were content with admiring Vin from afar. When I worked for the team one of the things I enjoyed the most was taking my parents (lifelong Dodger fans) on behind-the-scenes experiences. One evening, I was hosting my mom and three of her friends for a game, and I was set to give them a special tour before first pitch. Tommy Lasorda found out about my plan and told me to bring them by his private dining room off the press box, where the employees and media ate. About 90 minutes before the game I brought them by the room, where we came upon Tommy enjoying dinner with Vin Scully. I immediately started to freak out internally because 1) OMG VIN SCULLY, and 2) NEVER BOTHER VIN SCULLY. But before I could say anything, Tommy boomed out my name while Vin stood up from the table and said, “Well if this isn’t a sight for sore eyes! Hello, young ladies!” He then shook the hands of my mom and her friends, who were literally so shocked they could hardly speak (and, I should add, they totally thought I’d planned this). He and Tommy spoke with them for a few minutes, and when I said it was time to move on to the next part of our tour, Vin said, “Well, I hope you all have a pleasant evening. Thank you for coming by to meet with me, it was the highlight of my day.” We’d interrupted his meal but he’d been nice enough to give us a few minutes. My mom and her friends were floating. I was so grateful. But my favorite Vin moment happened later that season (2008). It was similar circumstances, although this time it was my friend Colin (Tommy’s assistant) and I meeting Tommy for dinner before a game. When we walked into the private room, we were greeted by Tommy and Vin. Vin stood up as soon as I walked in and sat down when I did. I sat at the table silently for most of the dinner, content to listen to the two legends talk and tell stories. At the end of dinner, Tommy asked me how Maddie was doing, and Colin explained to Vin that she’d been born prematurely. Vin listened during my update, then said, “May God bless her and hold her in his hand. 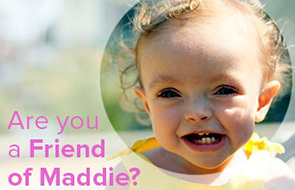 I’ll be praying for your Maddie.” It gave me chills to hear that magical voice say my daughter’s name. “Thank you, Mr. Scully,” I said. “Call me Vin,” he replied. Vin’s last game at Dodger Stadium was this past Sunday, after 67 years with the team. His tenure spanned five generations of my family, and when I hear him speak, I remember watching Dodger games with my grandma and great-grandma so many years ago. Vin was the soundtrack of summer for millions of Angelenos (and Brooklynites), and it’s impossible to imagine Dodger games with someone else in the booth. But if anyone deserves to retire, it’s an 88-year-old man, and I wish him the best. I’m sure he doesn’t remember either of our encounters, but they were incredibly meaningful to me and will stay with me for the rest of my life. Thank you, Vin. Way to make me cry first thing in the morning! I grew up in Simi Valley, and Vin was the soundtrack of my childhood summers. I miss California, and I miss the Dodgers and Vin so much. I’ve learned to love the Cubs almost as much as I love the Dodgers (not quite as much, but almost–Go Cubs! ), but I will never love another announcer as much as I love Vin. Dodgers baseball will never be the same. What a great story! A wonderful gentleman. His dulcet tones are a comfortable backdrop to my growing up. My dad having been born in Brooklyn to my born in Brooklyn grandmother in 1916, I was consciously a Dodger fan from age 6 in 1950. This story made me smile. Being a native Californian and a kid in the 50’s, I too grew up with Vin. Such a gift to all of us. Thank you Heather.Reading this I have a chill,and some tears. Ditto, that story made me smile. There will never be another like Vin. What a nice tribute to Mr. Scully. I bet he would remember you. I’m not much of a baseball fan (go, Giants? [my daughter lived in SF]), but I certainly recall the name Vin Scully. Great story, Heather! 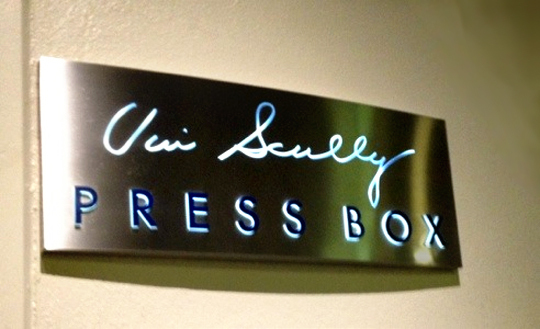 As a lifelong Dodger fan I can certainly appreciate Vin Scully – irreplaceable! I had to laugh when you said your Mom and her friends could hardly talk when they met him – I had the same reaction when I was fortunately enough to meet Maury Wills. He was so gracious to me – probably thought I was an idiot, but it was one of the highlights of my life! Maury is the NICEST!!! So glad you got to meet him!! !